A packed lunch is somewhat dreaded by most parents. With children’s fussiness & guidelines to follow it can be difficult putting together a healthy nutritious packed lunch that your child will actually eat. With #FloraLunchbox packed lunches have never been easier! Flora Distributed 631,000 Lunchboxes and healthy meal planners throughout the UK in light of recent research. Did you Know only 1.6% of packed lunchboxes in primary schools across England are actually meeting food based standards for school meals!? I know.. it shocked me too! Children’s Lunchboxes have only improved by 0.5% in the last 10 years and only 1 in 5 lunchboxes (17%) contain ANY vegetables or salad. Those are some pretty sad statistics and clearly this needs to change, Flora understands Parents don’t need telling off & just need a little help, especially with fussy eaters so with the Flora website full of tips & recipes anyone can put together a healthy and nutritious lunchbox for their child. Eva is VERY fussy when it comes to food and putting together a packed lunch for her can sometimes be quite a difficult task but with the Flora Planner & Recipes on-line it has never been easier! The Lunchbox Builder makes it easier to put together a healthy lunch for your child as it gives you healthy options containing easy-to-make plant-based recipes alongside Flora spread, giving you Mains, Snacks and Fruit & Veg ideas to choose from and of course a selection of Flora Spreads you can use. 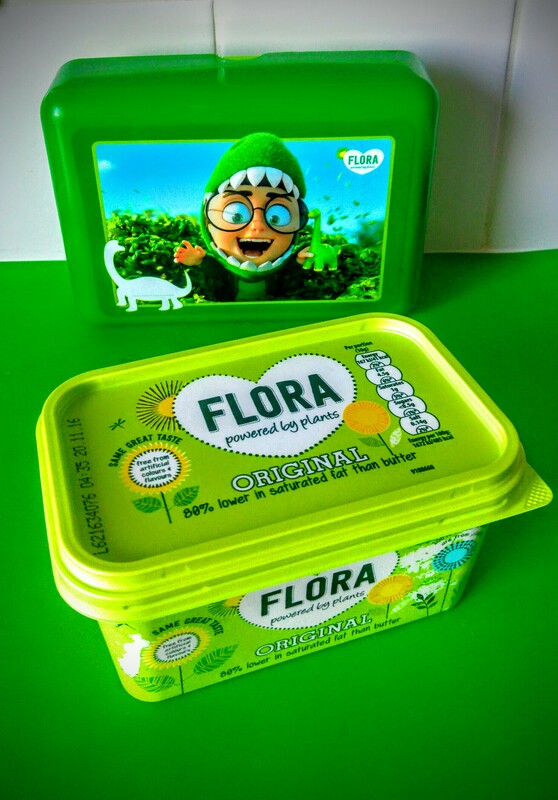 Every Flora tub contains plant oils, such as sunflower, rapeseed and linseed oils. Flora is lower in saturated fats than butter* and provides a source of healthy Omega 3 and 6. These essential fats contribute to the maintenance of normal blood cholesterol levels and are also needed for normal growth and to support the development of children. Flora also recently launched Flora Freedom. This is a 100% dairy free product, which is free of preservatives, artificial colours and flavours, and like the rest of the Flora range is approved by The Vegetarian Society. Eva loved pointing out things she likes & things she’d like to try (Mini pretzels!) on the Lunch Builder but came up with her own idea’s based on the builder where she is very fussy. She went for a Grilled chicken & Cucumber Flat bread using Flora original as her main, Raspberry Rice cakes & a Fruit Jelly for her Snack along with a choice of Banana, Apple or raisins. (I give her a few choices as she WILL change her mind several times across the school day & this prevents a meltdown). Bread sticks with dips & rice cakes are a big favourite lately along with crackers & crisp breads. Eva absolutely loves fruit so we always give her a variety, she loves apples, grapes, bananas, blueberries and melon. What’s your child’s favourite packed lunch? If your struggling for idea’s don’t forget to head over to the Flora website to see some yummy nutritious dishes even for the fussiest of children! Florasaurus is full of fun facts & tips & recipes.